And so we move from the best Tolkien module to the very worst. I don't know anything about John Ruemmler other than as the author of this travesty, written in a sophomoric and exclamatory style, nothing at all like the other ICE writers. "The lowly flea, mass murderer of Mirkwood? Impossible! No, it's true." Or: "Perhaps no creatures in Middle-Earth have tingled so many spines and inspired so many 'Yechs!' of disgust as the Giant Spiders of Mirkwod." Still worse: "Enough of gruesome, loathsome, evil creatures! Consider the mighty monarchs of the woods, the Great Bears." There is also plain incompetence, even silliness, as found, for instance, in this unbelievable description of orcs: "If they accidentally hack off a fellow orc's limb, the injured orc is likely to say, 'Hey, that's okay! I have another!'" Does anyone remember those April Fool parodies in the '80s issues of Dragon? That's what I thought Northern Mirkwood was on first reading. Unfortunately, the entire module is as bad as the prose, for it doesn't offer much beyond a bare-bones geographical sketch of the region and superficial overviews of the cultures of the wood-elves, dwarves, and the men of Long Lake. There is some useful background here, but not much; it's very possibly the worst Tolkien accessory ICE ever published. 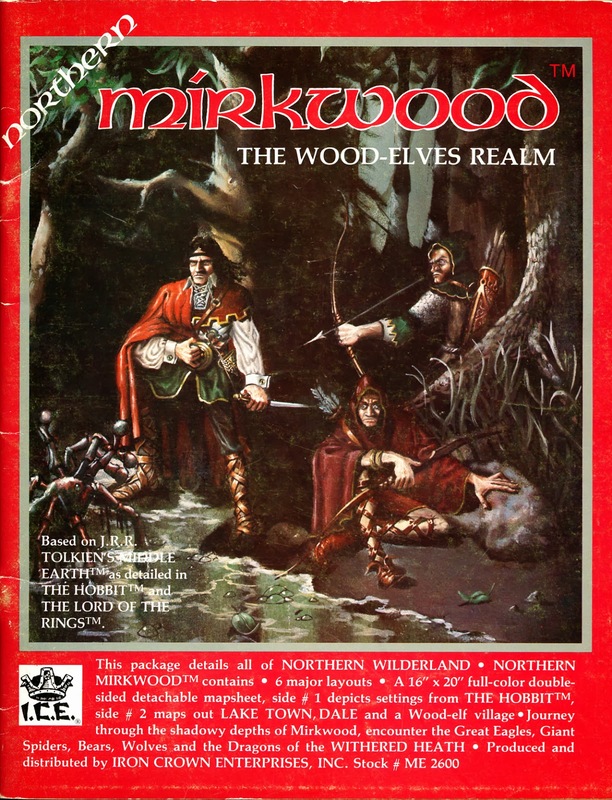 That's a double shame considering that it's Mirkwood, one of the grandest icons of Endor. Some might accuse me of a jaded perspective, reviewing this product in between top-notch modules like Lorien and Southern Mirkwood. But frankly Northern Mirkwood is so bad that positioning it between any other modules, no matter how dire, would amount to little more than trying to polish a pile of feces. The mapwork continues in offenses, though in its favor there is a four-page color detachable that's very well done. Beyond this lies pure failure. 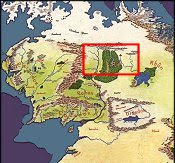 First and worst are the Halls of the Elven-King, which are more like TSR's Caves of Chaos, and what's amusing is that the author seems acutely aware of how poorly he represented Thranduil's home: "After reading this one might think that these halls are cold and damp, having perhaps visited natural caves; but this is not true." But declarations of this sort mean nothing, for indeed these caverns do no justice to what the elven structure should look like; on top of this, the rooms are given almost no detail whatsoever in the key. It's no surprise that ICE would later completely redo The Elven-King's Halls in a fortress module (to be covered next). The Lonely Mountain isn't much better. Like Moria it's portrayed with unsatisfying route maps (only the Chamber of Thror is given a proper layout), but Moria at least detailed the room contents. Erebor leaves almost everything to the DM like the Elven-King's Halls. Really the only thing given a proper, detailed layout is the minor tower of Sarn Goriwing. The towns of Esgaraoth and Dale are displayed but not described. If not for the four-page color insert, the mapwork would have gotten a rock-bottom rating of 1. What a waste. So who is John Ruemmler, and what are his excuses? Oddly enough, he authored Rangers of the North two years later, which for all its faults is a good module. By this time evidently something happened to discipline his prose, if not inspire better architectures. But really, the editor of Northern Mirkwood is as accountable as the author of this fiasco. I'm glad nothing this bad was repeated in future modules.